At Bluemay we pride ourselves on the quality of the product we manufacture. The whole team is trained to be in a quality circle that ensures the order you place results in your goods reaching you at the time and place specified. When you contact Bluemay you’ll be dealing with people who have experience of our products and services, and whose goal is to provide a level of service unrivalled in the industry. We always welcome visitors to the factory. Raw materials for Bluemay are sourced from select and long-standing suppliers. For example, the supplier of nylon for our threaded rod has not changed since we commenced in business in 1973. During manufacturing, product quality is automatically monitored within pre-set limits on all process functions. Adjustments necessary due to environment or slight material variations are automatically controlled by the “closed loop” systems of the injection moulding machines. SPC production data is used primarily to support in-house quality control and can be made available to customers. 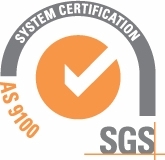 Our systems are certified independently by SGS United Kingdom Ltd to the AS9100 aerospace quality standard, which includes and goes beyond the ISO 9001:2015 quality standard. Download our latest certificate here.